Kensington Cares has been supporting education projects in Kenya’s Masai Mara for as long as we’ve existed. It is in our DNA. Recent projects have included a new Kindergarten and two dorms (one for girls and one for boys) to help students who often live far from school stay in school longer. Past projects have included lunch programs, school supplies funding and classroom construction. Our next project is our biggest and most exciting by far. Together with our community-based partners, Kensington Cares is spearheading a new model for education in the region – one that combines traditional academics with a focus on employment and career skills. Set in the Trans Mara District in Kenya, this school will not only be the first high school in the district but, in addition, will include facilities and teaching expertise to provide important job and income generating skills for success in the local economy and beyond. Much like traditional vocational schools, the national curriculum will be supplemented with the opportunity to focus on hands-on skills including disciplines in agriculture and dairy production, trade skills like carpentry, electrical, plumbing and engine mechanics, butchery and food sciences, as well as informational technology, accounting and hospitality and tourism-related skills. "The focus is on empowering the Maasai people to have access to skills and training that enable them to succeed in the traditional agrarian economy as well as opportunities in other thriving industries including tourism and information technology," said Jeff Willner, founder of Kensington Tours. 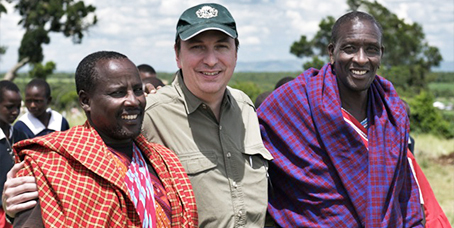 Kensington founder Jeff Willner breaks ground for the new Polytechnic High School, Masai Mara, Kenya. Dedication ceremony for two dorms and a new kindergarten funded by Kensington Cares. The project has been 18 months in the planning and will break ground soon. The land has been donated by the local community and was recently beaconed off – one of the last hurdles before the first shovel can begin to dig. The project will be a multi-year, multi-phase project that will start with the construction of classrooms, teachers’ accommodations, dining hall, administrative offices and communal space. Dorms will follow as well as facilities to support vocational training programs. Vocational training facilities (like plumbing and agriculture) will also function as income-generating projects to provide an ongoing source of income for reinvestment in the school, its students and future. "Years of experience and experimenting, of best practice benchmarking and of research have led us to this project," says Willner. "Our vision is for a school that is enduring and positively impacts the whole community. Travel and tourism have always enabled sharing, learning and positive growth. My hope is that this school can be a gold standard example of the good that can come when travel is utilized for a greater purpose." Watch here for more as the school begins to come to life. As we move forward, we will create exciting ways for K-Listers and all our clients who are interested to find out more, to visit and get involved. Kensington Cares is the foundation set up by Jeff Willner, founder of Kensington Tours, to support education initiatives in under privileged communities. Jeff grew up in Africa – in both Kenya and the Congo – and is still intimately connected to and committed to the communities where he spent his formative years. The Trans Mara vocational school project is a joint venture with Africa Mission Services (AMS) based in the Trans Mara district. AMS will coordinate and manage the on-the-ground construction and support set up of operations and daily management. Kensington Cares and the Trans Mara project are funded exclusively by Kensington Tours.